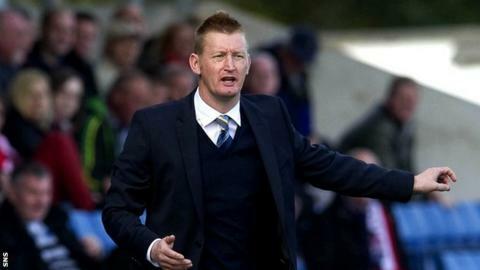 St Johnstone manager Steve Lomas has praised his side's tenacity after their victory over St Mirren at McDiarmid Park. The Perth side held off a second-half St Mirren fightback to claim a 2-1 victory, their fifth win in a row. And Lomas is convinced that his side's will to win is key to their recent good form. "All credit to the lads, they've got a resilience about them, a team spirit that can carry you far," he said. "We knew it would be hard and, obviously, we got two up and it's always a manager's nightmare at half-time because you know the next goal's crucial. "If they get it, it obviously gives them a massive lift, and they got it quite early and I thought, here we go. "St Mirren pass the ball well and they've got good attacking players and, at times, we were hanging on, but the sheer grit and determination carried us through." Lomas was pleased at the contribution of striker Nigel Hasselbaink, whose opener, against his former club, was his second for Saints. "I think Nigel can get double figures, I set him that at the start of the season," he said. "We've been working on him and Gregory on their finishing, trying to be a bit more composed in front of goal, and it certainly helped today." Recent signing Craig Beattie again came off the bench, but Lomas insisted that the former Hearts and Swansea striker would play an important role for the club after the international break. "It's just about getting Craig fit," he said. "We know the quality of player that he is. So we're hoping to use these two weeks to get some sort of fitness under his belt."